The Problem: The American regulatory system has no working, systematic process for reviewing regulations for obsolescence or poor performance, facilitating the accumulation of a vast stock of regulations. 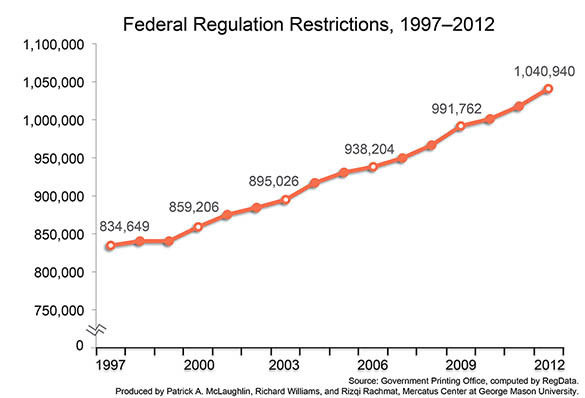 A recent study found that the accumulation of federal regulations slowed economic growth by an average of two percent per year between 1949 and 2005. Several earlier studies using broad indexes, such as those produced by the World Bank and OECD, have permitted cross-country comparisons of the effects of certain types of regulations. These studies have also found that regulations can slow growth when they impede innovation and entrepreneurship. In its most basic definition, a regulation is a law that “seeks to change behavior in order to produce desired outcomes,” and it does this by requiring or forbidding certain actions. 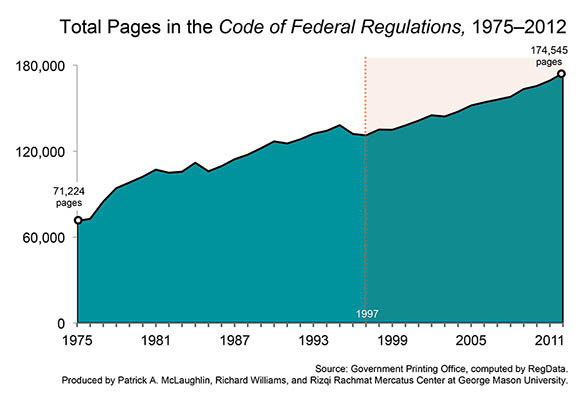 Figure 1 shows the growth of federal regulations from 1997 to 2012, as measured by counting the number of restricting words, such as “shall,” “must,” or “required,” that are printed in the Code of Federal Regulations each year. (For information on the methodology behind this chart, see our paper.) 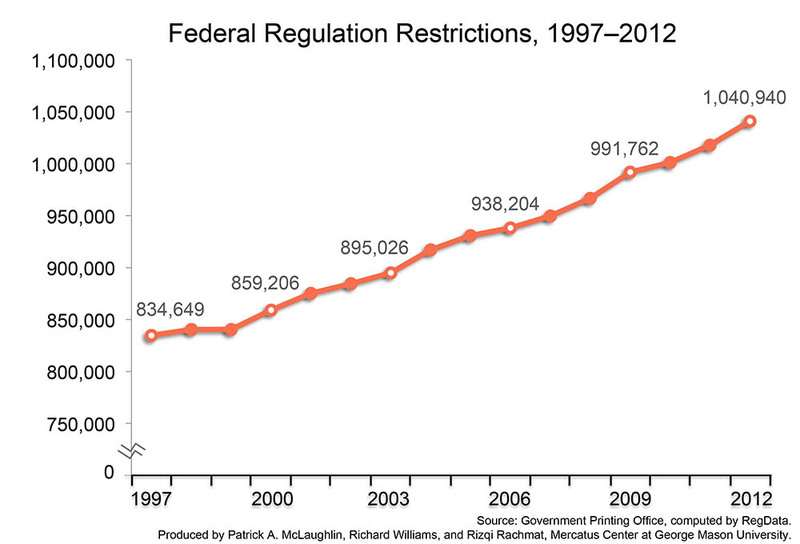 The total number of restrictions in federal regulations has grown from about 835,000 in 1997 to over 1 million by 2010. Over time, these accumulated restrictions can either directly foreclose paths to innovation or entrepreneurship or add up to the point where their cumulative cost makes certain actions prohibitively expensive. Every administration since Jimmy Carter’s has undertaken efforts to modify or eliminate nonfunctioning regulations. Notably, none of these efforts resulted in either substantial reductions relative to the total size of the Code of Federal Regulations or sustained changes in the rate of adding new regulations to the Code of Federal Regulations. Figure 2 shows that the stock of regulations, as measured by the number of pages published annually in the Code of Federal Regulations, never substantially declined, and in fact has consistently grown over the same time frame that these administrations attempted to retrospectively modify or eliminate nonfunctioning regulations. To date, there has been neither large-scale retrospective analysis nor the creation of a process that would eliminate failing regulations. Every attempt by presidents to direct agencies to review their own regulations in order to eliminate nonfunctional ones has yielded poor results. Agencies, despite direction from the president, have incentives to maintain and grow their regulations in order to maximize their budgets. In turn, in order to retain regulations that would be eliminated otherwise, agencies may either hide or fail to produce information that would help identify obsolete regulations in the first place. These and other obstacles must be overcome before retrospective review and elimination or modification of nonfunctional regulations can be accomplished in the United States. The Solution: In contrast to the repeated failures of the United States to clean up regulations, there are two successful government reforms that overcame similar obstacles: the Base Realignment and Closure Commission (BRAC Commission) and the Dutch Administrative Burden Reduction Programme (the Dutch Programme). Based on the success of these programs and our research, it is possible to devise principles for a successful solution. The process should entail independent assessment of whether regulations are nonfunctional. The process should ensure there is no special treatment of any group or stakeholder. The process should use a standard method of assessment that is difficult to subvert. Whatever the procedure for assessment, assessments of specific regulations or regulatory programs should focus on whether and how they lead to the outcomes desired. Regulatory agencies should be recognized as another important stakeholder, with incentives to keep and increase regulation. Congressional action—such as a joint resolution of disapproval—should be required in order to stop the recommendations, as opposed to a vote to enact or not enact. The review process should repeat indefinitely. 1 Our complete paper explains eleven characteristics of successful reform in more detail. We highlight just seven of the eleven here.